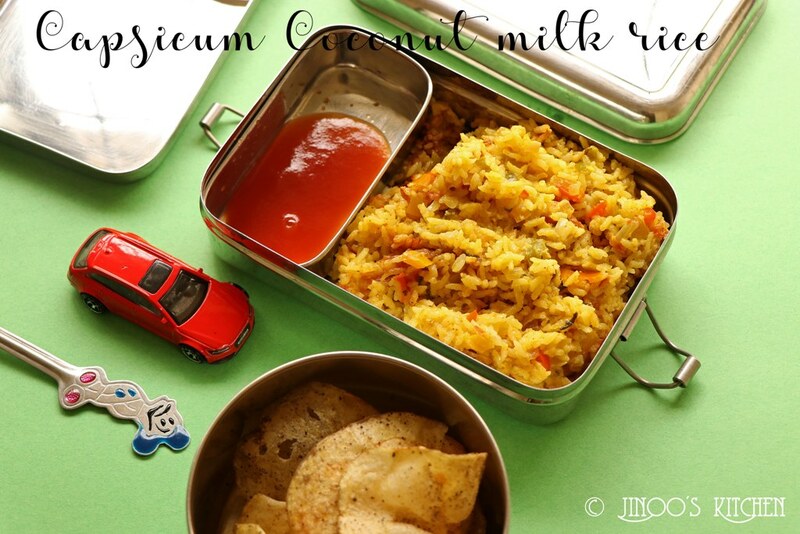 Capsicum coconut milk rice | capsicum rice recipe with step by step photos and video recipe. 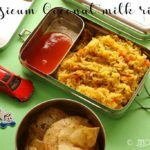 simple and very delicious rice recipe with bell peppers and cooked with coconut milk similar to the coconut milk pulao. this recipe uses seeraga samba rice. Instead of which, you can use even basmati rice. I personally prefer seeraga samba rice over basmati rice. two reasons that it is equally flavorful as basmati and is not a long grained but stays firm for pulao and biryani. long grains sometimes makes us feel lazy to eat 😛 i know am being weird. it gives a feeling of being full before actually being full. but for specific dum biryanis , basmati is only good. one of the easiest way to make the children eat bell peppers. I have used green, yellow and red. If you get the orange one, use that also. the rice will look more colorful and attractive. check out these jk kids lunch box series for more collection of kids lunch box. heat oil and crackle fennel seeds. add cinnamon, cloves, chopped onion and fry for a minute. add green paste(ginger , garlic and green chilli paste) and fry until raw smell leaves. further add chopped bell peppers and fry for half a minute. finely chop the tomatoes and coriander leaves. add it along with the turmeric powder, salt, chilli powder and garam masala. mix well and cook until mushy. soak the seeraga samba rice in water for 30 minutes and then drain the water. add the rice to the cooker along with coconut milk and adjust salt. when it comes to a boil, close and pressure cook for 10 minutes in simmer and then 1 whistle on high. switch off. once pressure settles, open and fluff it up. if you are not using coconut milk, just add plain water. coconut milk to be added is 0.25 more than the quantity of rice. that is for 1 cup rice it is 1.25..for 1.25 cup rice it is 1.50 cup coconut milk. when making for kids, chop the vegetables very finely so that it is easy tfor them to eat. 1.heat oil in a cooker and crackle fennel seeds. together add cinnamon stick and cloves. 2. finely chop the onions and add them to the cooker. saute for half a minute. 3. make a paste of ginger, garlic and green chilli. I have used 1 inch ginger, 4-5 garlic and 2 green chillies to make this paste. add the paste to the onions and fry til raw smell leaves. 4. finely chop the capsicum and add it to the cooker. fry for half a minute. 5. add chopped tomatoes and chopped coriander leaves. 6. Along with the tomatoes, also add turmeric powder, chilli powder, salt, garam masala and mix well. fry for a minute until the tomatoes are mushy. 7. soak the seeraga samba rice in water for 30 minutes. drain the water and add it to the cooker. 8. Now is the crucial part of the recipe. add coconut milk to the cooker. I have used 1.25 cups of coconut milk for 1 cup rice. this is the measure. 1(Rice):1.25(Liquid). This holds good for seeraga samba rice. mix well. Simmer: 10 minutes and then on High: 1 whistle – put off immediately after the whistle. 10. let the pressure settle on its own and open it. fluff it up. the rice will be sticky when hot but when it cools down, it tends to be soft and non sticky just as we wanted. 11. pack the lunch ! or serve with wither raita or tomato sauce.